Golf Simulators: Are They Worth the Investment in 2017? 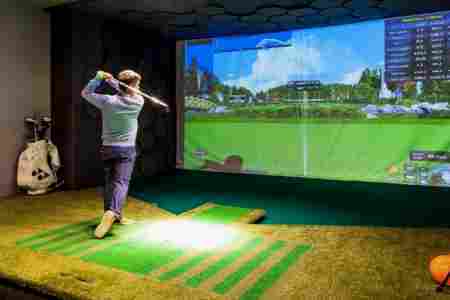 Golf Simulators: Are they Worth the Investment? The next time you go to a golf shop in order to purchase a golf club, you might see something which in theory should help you pick out the right club for you and your needs. This item is a golf simulator. 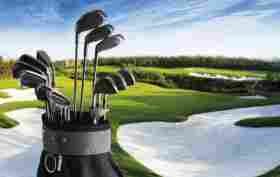 Years ago, within any golf shop, they would set up an area for you test a golf club, and you would be staring at a large bulls-eye; if you hit the bullseye, the idea was that you found the right golf club. If you didn’t hit the bulls-eye, then you needed to go look for another club. The technology within golf has changed dramatically since that time, and there might not be any greater example of this than a golf simulator. Once you use it to help pick out your gold clubs, you might think you need one of those at your house, or convince the boss to put one in at work. However, you have to ask yourself if they are worth the investment. First, we’ll start off with the benefits of the golf simulator. The simulator allows you to play golf within a very controlled environment, so no matter what the temperature is outside, you can play golf. Not only this, but you don’t have to pay any green fees or rent a cart, and there is no chance of you losing your golf ball. This is a great way for you to practice your golf shot without having to go travel anywhere besides into the area within your house or office where the simulator is set up. In addition to the convenience factor, the information you receive back from the simulator is very valuable to let you know how your swing is performing. The simulator can typically tell you how fast your swing is, as well as the velocity of the ball. Not only this, but the simulator can tell what kind of spin, if any, is on the ball, and will accurately display this on the screen. You can also set the simulator up to play in certain conditions, to help enhance your golf experience. You want it to be windier – it will move the golf ball on the screen to simulate where the golf ball will go in those conditions. You want the greens to be softer or firmer, you can do this as well. Perhaps you want to play in some rainy conditions – the screen will project this image, making you feel like it really is raining where you at. Talking about the screen, it is projected out in a HD quality, usually in a 1600×900 pixel format, giving you the clearest quality possible. This way, you can fully see where the golf ball is going with each swing. The screen is made from a very durable material which will be able to handle the thousands of golf balls hit at it. 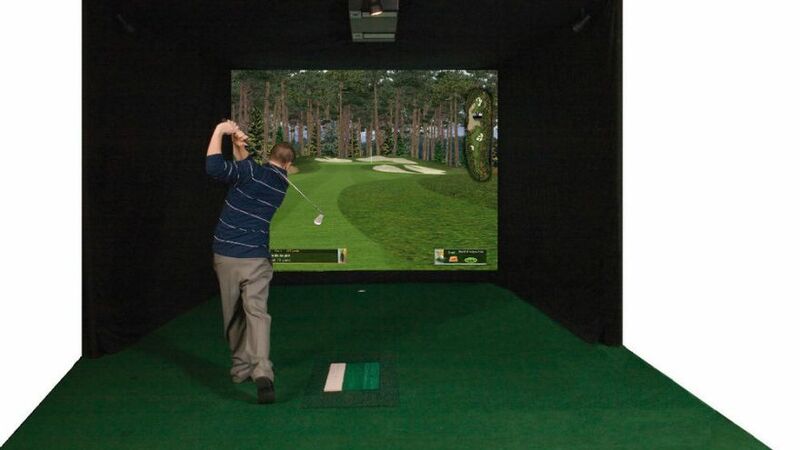 Depending upon what you are wanting to accomplish with your golf swing, there are a variety of different games available within each simulator. If you need to work on your drives, you can do this. If you need to work on your pitches, there are games which will help with this. If you want to work on landing the ball within a certain zone, you can also do this. Once you think you have mastered the art of these games, you can then transition over to playing on actual golf courses. Each brand of simulator has different rights to different golf courses from around the world. This is a very unique and great way for you to play across various golf courses from around the world and test your game out to see how well you would do on those courses. In addition to all of these features, there are many other multimedia applications you can use the simulator for. One of the best features is actually the capability of comparing certain golf clubs to each other, in order to give you the right feel and information concerning the golf club you are using, but also in giving you recommendations on which golf clubs might be best for you. This kind of information might take you hours on your own to figure out, but the simulator will take all of your information it has gathered from watching you and your swing, and make those recommendations based upon what is best for you and your needs. Other multimedia applications include being able to hook up most video game systems to the screen and playing those games on this screen. You can also watch TV, movies and any other kind of television event right on the screen of the simulator, which is basically creating a large projector screen within your house or office. Some models can even play shows off of your Apple TV, Kindle Fire Stick or any other similar dev ice. This is a tool which can fully be utilized by everyone within your household, and could dramatically help your golf game by allowing you to get in more swings than you normally would. So the big question is what is the price? In order to figure out if this is a good deal for you or not, you need to think about how much do you spend on playing on golf courses currently? Not only that, but what would it cost you to go and play on a large variety of golf courses around the country and world, and come up with a number which seems reasonable to you. Once you have this, you know what your budget could be for a golf simulator, and not just a financial cost. Is it worth it to you not being outside and play golf? 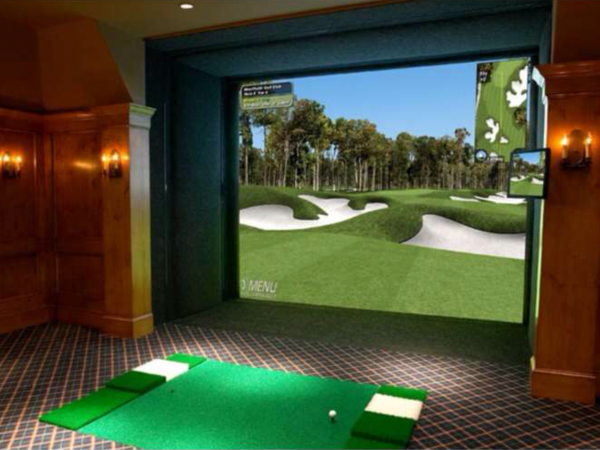 Would your golfing buddies be willing to come over and play on a simulator rather than playing out on the course? Are you alright if you get interrupted by family members or others when you are playing on your simulator at home? The average retail price of a very basic golf simulator is $2,500, but you basically get a white screen to hit your golf shot into. In order to get the virtual reality options we were discussing within this review, you will start at around $30,000. There are some models which go as high as $60,000 – once again, depending upon your needs, and what your budget is. So, are simulators worth it? Only you can really answer that question for yourself, but we would recommend the idea you would be giving up a lot of what makes the game of golf special by only utilizing a golf simulator. Being out in nature, interacting with various people and talking to them about the good and bad shots of the day, that is what makes golf great. A simulator can help with your swing, but there are too many other factors which outweigh the idea of it supplanting an actual golf outing.